DUE TO ISSUES WITH GOOGLE PHOTOS ALL IMAGES AFTER AUGUST 2015 ARE NOT SHOWING, I AM TRYING TO FIGURE OUT HOW TO GET THIS WORKING! While we were installing the network with the enclosed rack from THIS post we also built a new network for the adjacent office. As these 2 offices were within the same main office space, I used different colors to differentiate the two networks. The main network from the other post had blue and white network jacks. This network uses red and green network jacks. 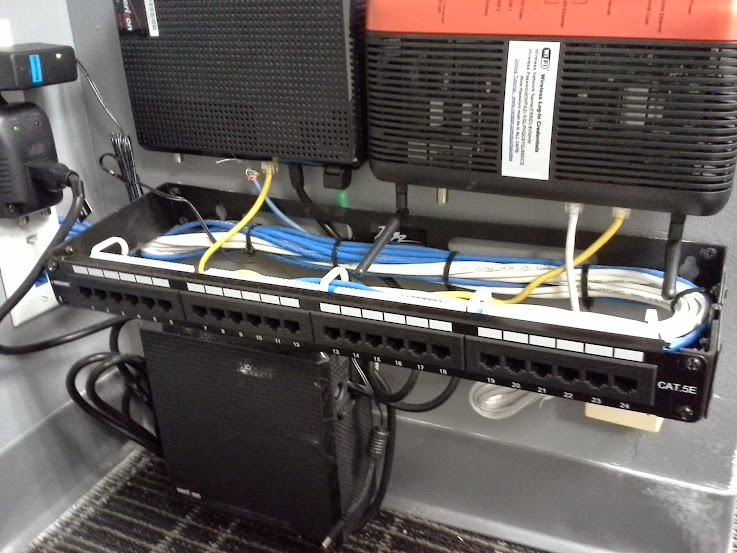 Patch panel installed - and Verizon installed their FiOS equipment. 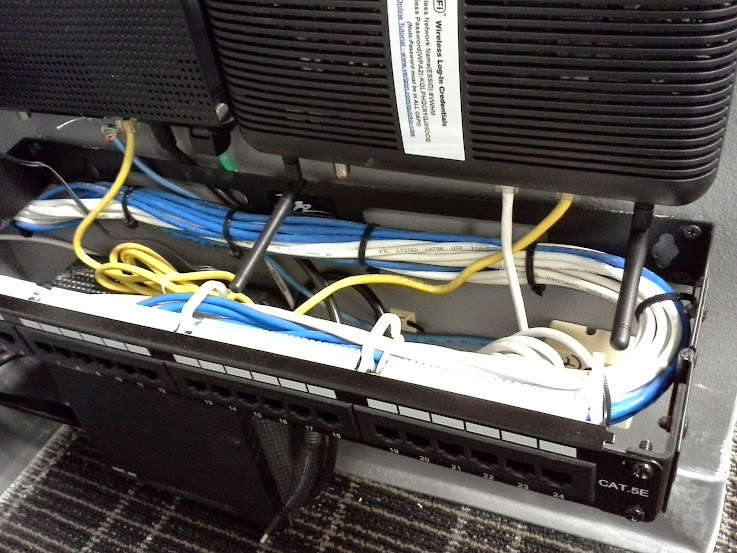 The reason for using different colored jacks for this network compared to the other was that they are in a shared office space. If at any point in the future they move out of this office space the future technician or tenants should easily identify that these are separate networks where the patch panel is located in 2 different locations within the office. 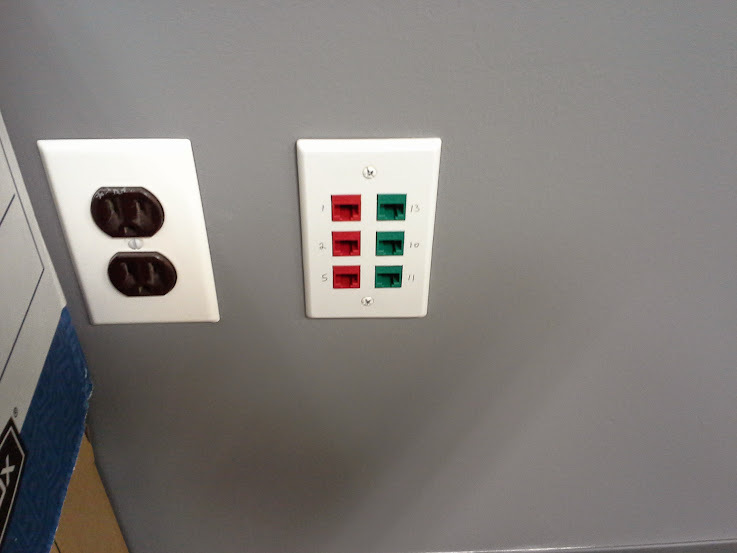 Red and Green network jacks. There was 2 jacks in this office originally that went to the main patch panel for the entire office. I moved those 2 jacks over to where the new patch panel is located so that there are 2 CAT5 runs that run between the patch panels. This will be useful in the event that the internet for one company goes down, they can temporarily share an internet connection - or for any other reason that something needs to be shared between the networks. Another angle of the panel and Verizon installed equipment. Crap actiontec router top right. We generally never use the provided router that Verizon provides with the FiOS services. We usually replace them. 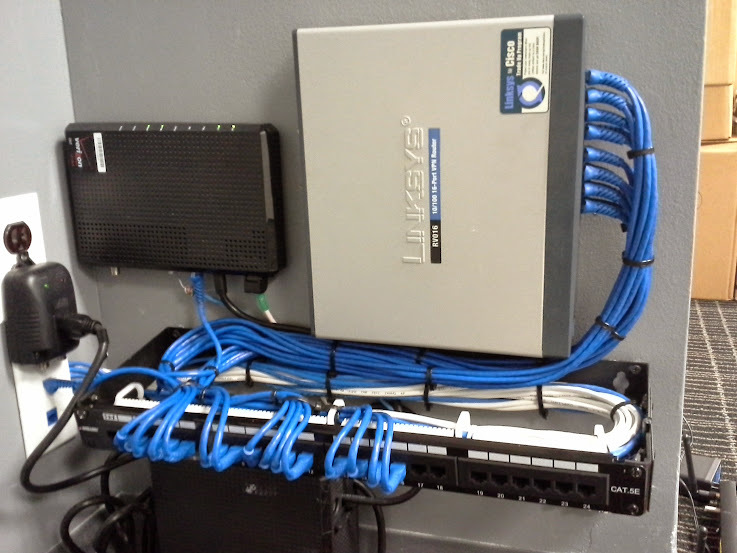 In this case this was an existing customer who had a Linksys/Cisco RV016. In order to replace the Verizon provided router you need to have the DHCP lease released from the Verizon router. This was done this time by disconnecting the Verizon router upon arrival. By the time we were ready to install our router the DHCP lease had expired and we were able to replace it with the customer provided router. Occasionally you may need to call Verizon to release the DHCP on the circuit in order to replace the router. Another angle of completed panel patched in. 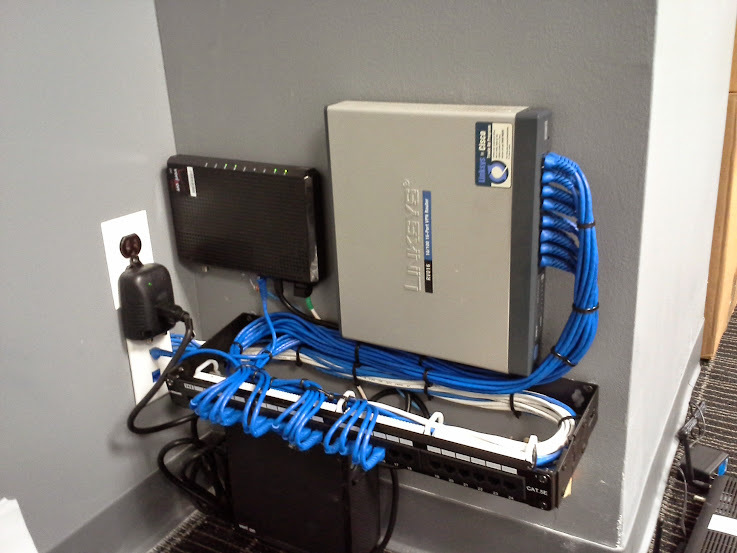 Paging, door phone, patch panel install. The worst router I ever came across! Get a $50 gift card when you sign up for Sprint! Ooma Telo No current promotion, but usually you get a $50 discount from using this link. © NYPHONEJACKS 2015. Simple theme. Powered by Blogger. WOW... I would like to thank everyone for coming to visit. There is still a week day left in February, but over the last week you have all contributed in more than doubling trippling quintupling the average monthly page views for this site. In fact the Bingiton post has just passed surpassed by double the highest viewed post on the site (from 2009!) in just over one week time. Regardless what brought you here, take your time and look around, and subscribe to my blogger feed. This section is a description of some of the content this blog.